We will allow some self seeding within each category. Please arrive at least 10 minutes before start time. Please use single track and do not climb up Cascade Road. Time penalties will apply if spotted. Please arrive at the start of Detonate by 8:50am. You can ride up the road if you would like. Join coach Jodie Willet for a course pre-ride and let her assist in conquering the tricky bits and refine your current skills set. Do you have the skills to tackle a double black diamond special stage? We are yet to decide on what trail we will use as there are whispers of new gnar in them there hills. . . Whether you are riding or heckling this will be a stage to remember. This will be run in conjunctions with the main race on Sunday. ANY OTHER CATEGORY - Ride Special Stage for the thrill and bragging rights. You will be given a time but it will not count toward your overall result for the event. Tick the box when registering online. Shoot us an email at kingmillerevents@westnet.com.au with any questions regarding. *Note - There are 3 different courses available from this link. Select depending on category. Stage start and finish points will be marked. Trails will not be closed. I may be biased but I love the Dial and can’t wait to have the series visit our quaint little seaside town once again. This year we will move away from the 2-day format and will focus the event on the northern slopes, leaving Saturday for travel, practice and exploring the wild expanses of the majestic Dial Range. We have gained special permission from Parks to use the Mt Dial mountaintop stage for our event. It is a very unique stage as you climb and descend the same track. Please do not ride this trail outside of the event. We will organise structured practice sessions prior to the event. We are privileged to be able to use the wickedly awesome trail located on Private Property. Please do not ride prior to the event unless you have permission. Guy and the team have come to the party once again and will be serving up a feast from the farm and garden on Saturday evening. Format will be a buffet style smorgasbord at great price of $35 per head, $45 with a home style desert. Book via the website (CLICK HERE) or add it to your entry when registering. As a bonus for those dining, you will also have the opportunity to camp at the farm also. No frills, no showers but water and toilet available. Register your interest for this option when booking dinner. Stage start and finish points will be marked for practice but trails will not be closed to the public. Ride at your own risk and save the race face for Sunday. Mt Dial and Marcelo’s practice times below. We have options for dinner on Saturday night. Either hang out at the top end of town and dine at the Eagles Eyrie or hang at the Bike Park Hub for a great meal with mates. Bookings limited for both options so get in early. 3.00pm - Special Tech Stage - Elite Only & by request - Race or Heckle!!! Do you have the skills to tackle a double black diamond special stage? The crew at Maydena Bike Park will be putting together a stage full of gnar that will have the heavy hitters frothing. CATEGORY - Ride Special Stage for the thrill and bragging rights. We will be given a time but it will not count toward your overall result for the event. Tick the box when registering online. ELITE SERIES RESULTS: Your series result for this round will be calculated without the special stage and included with OPEN category. The Meehan Range is going from strength to strength as it evolves into the staple venue for the Hobartian population. With new trails popping up on a regular basis there is always something new to enjoy. Thankfully its on a bloody great hill will makes it perfect for ENDURO!!! ENTRIES CLOSED - WERE FULL!!! Stage start and finish points will be marked for practice but trails will not be closed to the public. Ride at your own risk and save the race face for Sunday. Please ensure you are at arrive 5min before designated start times. There will be shuttles galore available on Saturday. Save your legs for Sunday and book via the links, YEEHAAA. . .
Do you have the skills to tackle the double black diamond EWS stage of the year?? We will be running a special stage on this very trail. CATEGORY - Ride Detonate for the thrill and bragging rights. We will give you a time for Detonate but it will not count toward your overall result for the day. Tick the box when registering online. OPEN SERIES RESULTS: Your series result for Rnd 4 will be calculated without Detonate and included with OPEN category. Under new management and super keen to impress, the Dorset Hotel is going to put on a SPIT ROAST to get us ready for an epic day of competition the following day. If you have already entered sign up using the below link else select the option when registering. Friends and family more than welcome. - Jnr (U15) and SPORT - Stages 2-6 & 8 only. Receive a shuttle from Derby to Black Stump before stage 2. No Trouty. Ride from Devil Wolf straight to Monument. That's right folks!! 2 events down south this season. 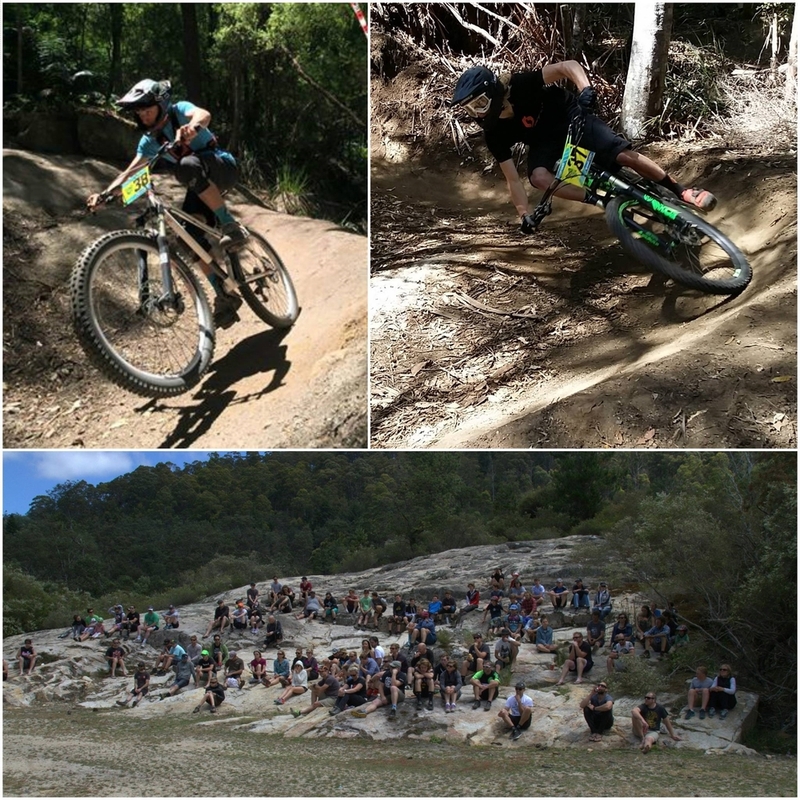 The Meehan Range has been a staple in the Hobart riders diet for many years now and the time has come to get a bit of Tas Gravity Enduro Series action on that there hill. Sik Nik and the Dirt Devils have warmed the trails up nicely over the winter and we look forward to building on that platform with an all day gravity feast. After a very successful trial event earlier this year, we are going to head back to the epic trails of the Dial Range for round 2. This event will once again be run over 2 days and include the legendary trail in Marcelo's backyard, along with the epic mountain top descents. Mount Gnomon Farm will again be partnering with our event to add a bit more class to the weekend. Entries opening soon. Toilets - YES / Power NO / Showers - N0 - but we are looking into hiring showers in town Saturday Evening / Spectacular outlook and awesome vibe - HELL YES!! To eliminate an epic liaison stage between the Leven River and Mt Dial we have made the decision to run this event over 2 days. Day 1 - Consists of Stage 1 on the legendary trails in Marcelo's backyard and Stage 2 will start from the top of Mt Dial and descend all the way back to near the MTB park. For the adrenaline junkies, we will then have a slope style contest on the crazy features at the Penguin MTB Park before calling it a day. Day 2 - Start and finish at the Gnomon Farm. Stage 3 will be the one for the speed freaks on the Sth Duncan trail then stage 4 will be the epic descent from near Mt Duncan to the Leven river. This stage is raw, steep in places and ENDURO AS. . . . . You know what. The perfect finish to an epic adventure near the sleepy coastal town of Penguin. Day 1 car parking - There is very limited parking at Marcelo's. Please park at the MTB park and commute to Marcelo's (5 minutes). If you have family/friends attending to give you a good heckle and show some stoke, then you are welcome to park at Marcelo's. If you turn up to Marcelo's with competitors only you will be turned around so please take note. Saturday's proceedings will finish at the MTB park. In order to manage numbers on the top of Mt Dial and ensure minimal impact, we are going to split into 2 groups on Day 1. Group one will race stage 1 and group 2 will race stage 2 before swapping. A start list will be available prior to the event to highlight which group you are in. Both groups will meet at the Penguin MTB Park post race. 9am - Rego opens at Marcelo's - Stage 1 open for practice. Pre ride of Marcelo's is a requirement! No pre ride - NO RACE!! A huge thank you to Guy from the Mount Gnomon Farm the Cardona family and the local Parks and Wildlife for all their support in bringing this one together. We have teamed up with Cascade Brewery, Hobart City Council and the Wellington Trust to bring you an event of epic proportion. Set on the majestic slopes of kunanyi / Mt Wellington and based out of the iconic Cascade Brewery, this event will be one to remember. With a slick combination of cruise and race stages, your day will be a tough one, but one to savour for the ages. This event will start and finish on the doorstep of the iconic landmark that is the Cascade Brewery. From there we will ascend the lower slopes of the mountain before linking together some classic "Special" stages and "Cruise" stages as we make our way back to base. The "Special Stages" that we have included will keep even the fastest pinner entertained for well over 20min of race time. Yeehaa!! The first climb of the day is a corker. From Cascade to The Springs via the dirt should be enough motivation to keep the legs turning during these colder months. But remember what goes up, must come down, and what a descent it will be!! Junior riders can catch a shuttle up the second half of the first climb. This will cut out about 400m of climbing. A big shout out to the Wellington Trust, Hobart City Council and the quality Australians at Cascade Brewery for their assistance in getting this one off the ground. To eliminate the epic liaison stage between the Leven River and Mt Dial we have made the decision to run this event over 2 days. Day 1 - Consists of Stage 1 on the legendary trails in Marcelo's backyard then we will all ride to the top of Mt Dial together before we descend back to the MTB park racing Stage 2. This event will be a stand alone event and not part of a series. We will organise a series over the 2017 / 2018 Summer. 9am - Rego opens at Marcelo's - Stage 1 open for practice. Strongly reccomend at least 1 run. This event will finish around midday Sunday and there is no need to rush home. Hang around and feel the relaxed vibes coming from Half Way To Forth whilst you enjoy some tasty tucker accompanied by a crafty beer or Artisan cider. There will also be some family oriented activities available such as piglet patting and secret life of pig tours. Concert free for all competitors. A huge thank you to Guy from the Mount Gnomon Farm for all his support. Well I don’t think I can say anything that has not been said a thousand time before but we all know how this venue has changed mountain biking in Tasmania and Australia forever. After the success of last years event and new epic descents opening soon, we thought there would be no better way to stage the season grand finale than to host a 2 day gravity fuelled extravaganza at this amazing venue. For those not familiar with accommodation at Derby / Weldborough here is a basic rundown. Derby Camp Grounds - Free camping by the river with coin operated showers down the road. The North West Lions Club will be onsite at both Weldborough on Saturday and Derby on Sunday cooking up a storm. Weldborough Hotel will also be cooking up their usual gourmet meals on Saturday also. Please bring some cash for a post-race BBQ feast. Riders have spoken and we have listened. "GET AN EVENT TO HOBART!!!" they said, so we have teamed up with Cascade Brewery, Hobart City Council and the Wellington Trust to bring you an event of epic proportion. It has been quite a lot of work to bring all this together but it will all be worth it as we bring to southern Tasmania what they have been craving for so long. Set on the majestic slopes of kunanyi / Mt Wellington and based out of the iconic Cascade Brewery, this event will be one to remember. With a slick combination of cruise and race stages, your day will be a tough one, but one to savour for the ages. Rnd 3 will start and finish on the doorstep of the iconic landmark that is the Cascade Brewery. From there we will ascend the lower slopes of the mountain before linking together some classic "Special" stages and "Cruise" stages as we make our way back to base. The "Special Stages" that we have included will keep even the fastest pinner entertained for well over 20min of race time. Yeehaa!! 3 - We have included a SPORT category where riders can catch a shuttle for a significant part of the climb. Riders will stay in their normal category but their results will be listed beneath those that have completed the full course. As mention above we will be offering a sport category to support those that genuinely do not think they will be able to make it up the climb. Sport riders will receive a shuttle for the second part of the days major climb eliminating around 400m of elevation gain. Sport riders will stay in their original category but their results will be listed below those that complete the full course. If you have already entered and you would like to take up the sport category uplift option please email kingmillerevents@westnet.com.au with your intent and bring $10 cash on the day. If you are yet to sign up then you can pay for this option online. Unfortunately this event was cancelled due to horrendous weather. Dial Range Course Preview from King Miller Events on Vimeo. Persistence has paid off and we now have an incredible new venue on the NW Coast to make the 2016 series truly STATEWIDE!! The Dial Range is a stunning wilderness experience. This course includes epic race stages that will take you from mountain tops to riverbanks via dense bushland on old fire roads and narrow trails. These trails are different to anything we have raced on before. No sculpted MTB specific single trails here, these trails are OLD SCHOOL!! Including fast open sections, rock gardens, creek crossings, natural berms that will hold you at 30-40km/h, water bar launching pads and much more to keep you entertained all the way to the finish line. Add to this the scenic views from the ridges and mountain tops along the course and this is going to be a day that you will never forget. On Saturday, we will have social activities at 2 venues. From 12-2pm the Cradle Coast MTB Club will host riders at the Penguin MTB park for a session at their incredible jumps park. This unique set of jumps that are unlike anything you will see anywhere. Whilst this air time is happening the club will put on a BBQ at the viewing platform. For those who have not seen the viewing platform it is an elevated area that overlooks the jumps and perfect place to relax and enjoy spectating. Then from 2pm, those that have signed up will ride from here to Marcelo's. Local trail building legend Marcelo Cardona has agreed to open up his backyard for us to experience. It's an amazing place and we are truly privileged to have this opportunity. In Marcelo's spare time (I am surprised he has any) he likes to play Spielberg. Check out a couple of his quality edits below to get the adrenaline pumping. I would like to thank the team at Parks & Wildlife, the Gnomon Farm and Marcelo and family for their support in bringing this event together. Please note - The trails in Marcelo’s backyard are some of the best you will ride anywhere, but please understand they are on private property and not open for the public to ride before or after this event without invitation or permission, no Strava and please no rubbish. What better way to kick off the season than by getting nostalgic and revisiting and old favourite. Based around the legendary Juggernaut, Hollybank is a gravity fiends paradise. With its unique mix or technical terrain and flat out fun stuff , it is unlike anything else on offer in Tassie and has put quite a few eager mainland MTBers on big birds en route to come and sample its goodness. Combine Juggernaut with the flow and g-force inducing berms of Tall Timbers and you have the perfect venue for a great day of Gravity Enduro racing. So get your mates together, lets kick off the season with a bang and get some points up in the overall 2016 series early on. LET THE GAMES BEGIN!!!!! Stage start and finish points will be signed for unofficial practice. We encourage riders to scope out the course but please be respectful of other users as the course will NOT BE CLOSED!! Save the race face for Sunday. Course will not be fully marked until Sunday. As we don't want to burn the whipper snappers out before they reach the senior ranks we are offering them a shuttle option for the 1 major climb of the day. Everyone else will be required to ride the climb in the true spirit of enduro.